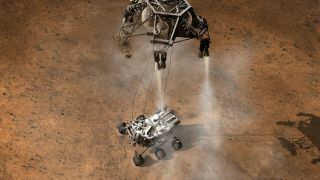 NASA will hold a press conference Monday (July 16) to discuss the Aug. 5 landing plan for its huge Mars rover Curiosity, the largest rover ever sent to the Red Planet, and you can follow the briefing live online. The Mars rover press conference begins at 1 p.m. EDT (1700 GMT, 10 a.m. PDT) Monday at NASA's headquarters in Washington, D.C., and will be webcast live on NASA TV for the public to follow along. The press briefing will "discuss the upcoming August landing of the most advanced robot ever sent to another world," NASA officials said in a statement. "A new public-engagement collaboration based on the mission also will be debuted." Internet viewers will be able watch the NASA briefing on the Mars Science Laboratory mission and Curiosity rover on the NASA TV channel, as well as participate in a moderated chat via Ustream. The car-size Curiosity rover is the centerpiece of NASA's $2.5 billion Mars Science Laboratory mission to determine if Mars has ever harbored conditions favorable for primitive life. The mission is overseen by NASA's Jet Propulsion Laboratory in Pasadena, Calif. The Curiosity rover launched in November 2011 and will land at 10:31 p.m. PDT on Aug. 5 (1:31 a.m. EDT/0531 GMT on Aug. 6). NASA's Mars rover Curiosity is the most capable robot ever sent to the Red Planet. The rover carries a suite of 10 experiments to study the Martian surface and atmosphere, including a laser to determine chemical properties and a sample analysis laboratory. Curiosity will land in a huge target zone called Gale crater, a 96-mile (154-kilometer) wide crater located near the Martian equator. The rover carries a nuclear power source in order to feed its onboard systems during a planned two-year mission.